Can be taken alone or with rice ,sambar rice and curd rice. Try and post your comments. Grind green chillies , ginger piece and garlic into a paste. In a frying pan, heat 2 tbsp. of oil and saute chopped onions till the onion is golden brown. Add coriander and mint leaves, chilli powder, cumin powder, cinnamon sticks, cloves, green cardamoms and green chillies-ginger paste.saute till oil separates from the mixture. Add boiled and mashed potato next and then turmeric powder, pepper powder and salt . mix well. Add boiled and shredded fish . saute till the mixture becomes thick and evenly spread like dough.Remove from fire. Let it cool for 20 mins. Form into desired shape pieces using moulds. Dip the shaped doughs in beaten egg and then roll them in breadcrumbs. Heat the remaining 3 tbsp. of oil in a frying pan and shallow fry until golden brown on both sides. Serve hot with tomato ketchup, onions rings and garnish with coriander leaves. Very yummy christie. My husband also loved it. Nice and spicy. 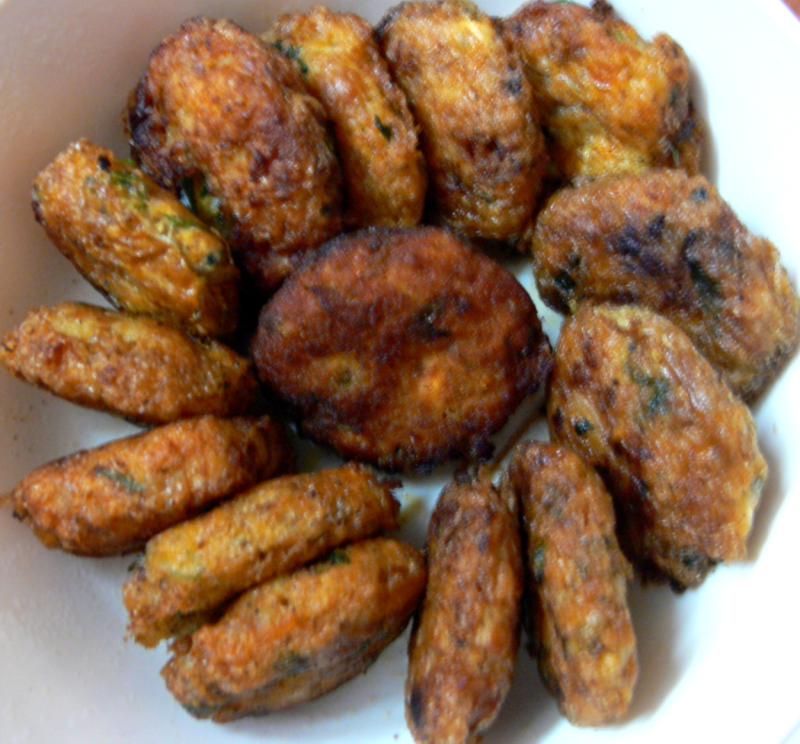 Hi Sneha, thanks for trying the Fish cutlet recipe. i like most of your recipes esp. Fried okra in rich gravy and the Capsicum curry. hi christy, this is really yumm...except for the pepper i use all the other ingredients you have mentioned. you can replace the cumin powder - 1 tsp with fennel seeds powdered - 1 tsp if you prefer the fennel flavour. Grind green chillies-3 no.s,cinnamon stick -1 no,cloves-1 no,green cardamom-1 no,ginger piece and garlic (as mentioned in the ingredients)into a paste. If you use this paste,then no need to add the chilli powder(ie.1tsp).